One of the great things about gardening is that it always gives you a second chance. Mess anything up, get the dates wrong, miss an opportunity and nature will accommodate you. I thought I'd missed the chance to have autumn planted garlic for the summer. I was wrong, because nestling alongside the comfrey, where I'd missed a couple of bulbs during last year's harvest, were a two beautiful nests of fresh green garlic shoots just ready for transplanting into the new bed I'd made for them. 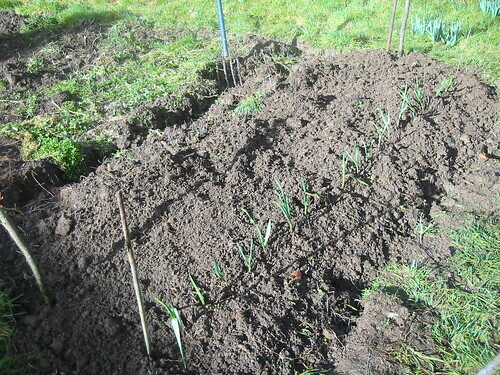 Along with this row of lucky strikes I've planted another two rows of garlic cloves, which should still make good bulbs but not as good as the autumn started sort, a row of shallots (saved from last years crop), some parsnips, White Gem which we've always found reliable in a heavy soil and two rows of Broad beans. The plan was to complete the digging on this small back garden patch before I went back to the UK but unexpected snow yesterday kept me indoors and then the soil was so wet and claggy I decided that I was damaging the structure more by walking on it than I was improving it by digging and I've covered the second half with plastic to warm and wait until the weather improves. 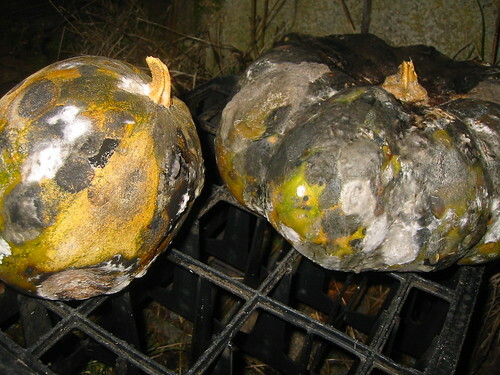 This sorry sight is what happens to pumpkins if you store them too cold over the winter. The ones back in Newport Pagnell with the benefit of central heating are keeping good condition considering we're into March now, six months from harvest but these unhappy fruits have suffered the chill of Normandy and turned into, as my friend on Flickr Herbi said, pumpkin zombies. I've put them out in case they eat my brains. I've only been here a few days and now have to return to the UK just as I'm getting started. 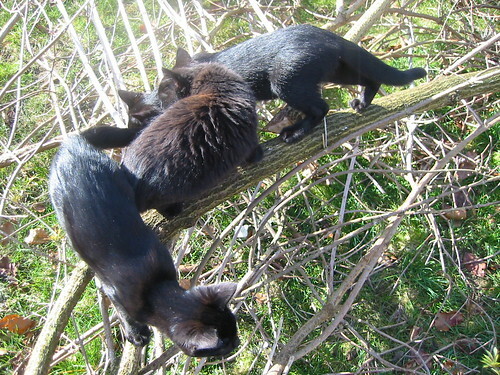 We hope to be back next month and in the meantime it will be wonderful to get back to the kittens. It's been really strange living here without them.